Bryling is a Nord warrior, a thane of Solitude, and the owner of Rockwallow Mine. She has a house in the city but spends most of her day in the Blue Palace. Very rarely, she can be found browsing the marketplace in Solitude. She is evidently having a secret tryst with Falk Firebeard, the steward of Solitude. Bryling wears an upper-class outfit consisting of a fur-trimmed cloak, fine armguards, pleated shoes, and a copper and moonstone circlet. She wields a steel dagger and carries her house key and a selection of upper-class loot and gold. She can be found in the Blue Palace for most of the day, from 8am to 8pm; eating lunch at 1pm and going to sleep at midnight. Bryling may greet you, saying, "Thane Bryling, at your service." or "I can always find time to share a word with a warrior." Despite supporting the Empire, she respects the determination of the Stormcloaks, stating, "Many condemn the Stormcloaks, but I refuse. There is honor in fighting for what you believe." as well as commenting on the war, "This godsforsaken war is dividing our people and destroying our land." 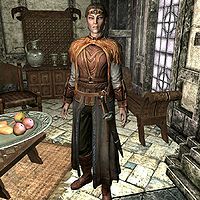 It was intended that Bryling could also give you the quest to become thane, suggesting that she was intended to be the Stormcloak Jarl of Haafingar. During the quest Payment Delivery, you can tell Bryling that you have a message from Pactur, which she will reply to with: "Is everything all right? I've not heard from Sorli or Pactur in some time." Telling her that everything is fine, she will thank you, saying: "That's good news. I was starting to fear something had happened. You have my thanks." Her secret conversation with Falk Firebeard may occasionally happen right in the Solitude Court, in front of everyone else. This page was last modified on 3 April 2016, at 18:25.